The Kedarkantha trek takes you through a fairy-tale landscape of forest verdure, snow-blanketed meadows and mountain silhouettes. The trail starts in a pine forest with a carpet of leaves in various hues of brown. One of the highlights of this trek is the Juda ka Talab, a beautiful lake surrounded by forests. In the winter, the ice layer on the lake becomes so thick that you can even walk over it. In summer, it's a delightful campsite for your first night of camping. And finally, the crowning glory, the Kedarkantha summit. You'll feel like you’re on top of the world up here, with enthralling view of Himalayan peaks stretching out in all directions. • Trek to Kedarkantha through winding trails in forests of oak, birch and deodar. • Bask in the glorious sunsets on the way to the Kedarkantha base camp. 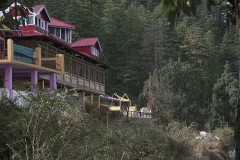 • Enjoy your stay at some of the prettiest campsites in the Himalayas. • Be enthralled by the beauty of the Juda ka Talab, an enchanting lake flanked by trees on one side and meadows on the other. • Take in the spectacular view of Himalayan peaks and the Gangotri and Yamunotri ranges at the Kedarkantha summit. 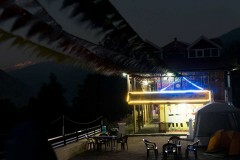 The operator provides basic amenities in the wilderness of Himalayas, so please don’t expect any luxury treatment. Kindly do not carry any valuables during the Kedarkantha trek. The operator will not be responsible for any loss of baggage, goods, air tickets, passport, cash, traveller’s cheques, or any other travel document or item owned by you while on tour, whatever the cause. You must be a responsible trekker. Behaviour that can cause danger, annoyance to others or can interfere with the trek procedures may lead to termination of your participation from the trip, with no right to refund. Participants must treat all equipment provided by the operator with care. Participants must adhere to the instructions of the trip leader/guide at all times during the trek to Kedarkantha. Consumption of alcoholic beverages, drugs etc. 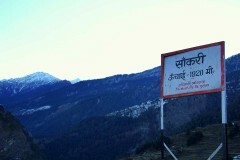 during the trek to Kedarkantha is strictly prohibited. For cancellations made 0-15 days before the start date of the Kedarkantha trek: No refund. For cancellations made 16-30 days before the start date of the Kedarkantha trek: 50% of the total cost will be refunded. For cancellations made 31 days or more before the start date of the Kedarkantha trek: 90% of the total cost will be refunded. There will be no refunds in case of road blocks or accidents. Any expenses due to unforeseen circumstances shall be shared by all trekkers. The operator is not liable to refund these costs. All trekkers are solely responsible for their own possessions. The operator reserves the right to modify the itinerary or cancel the Kedarkantha trek for your own safety or in case of unusual and unforeseen circumstances. Before starting the Kedarkantha trek, please let the operator know if you have any medical conditions. By participating in this trek, you accept that you are aware of the personal risks and dangers attendant upon such travel. By booking this trek, you assume responsibility of all such risks and release the operator from all claims and causes of action arising from such damages or injuries or death resulting from these inherent risks. In the case of illness or an accident during the Kedarkantha trek, all hospital expenses, doctor fees, evacuation from road or mountain or any other charges incurred as a direct or indirect result of your illness/accident are your responsibility. The operator reserves the right to take photograpsh during the Kedarkantha trek and use the images for their website and promotions. If you are not comfortable with your images being online, please do make this clear before the photos are taken. You'll arrive at Sankri Village and meet the trek host at the local homestay. If time permits, you can explore this beautiful village or just walk around Sankri. You will be provided with dinner at camp, and will sleep in tents at night. You will begin the trek after a fortifying breakfast. The trail will take you through a beautiful forest of oak, birch and deodar to the soothing sound of small streams flowing through the rocks. After around 2-3 hours, you will reach Juda ka Talab. You'll have some time to explore the lake and the pine forest around before proceeding toward Kedarkantha base camp. 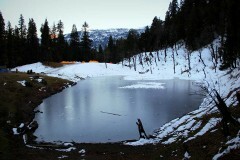 From the campsite, you'll be able to see the summit of Kedarkantha, which makes for a spectacular view as the sun sets. Overnight in tents. You will start trekking early on day 3 as it is the summit day. The climb is moderately steep, with rewarding views all along. The trail winds through a forest of oak and leads to a straight climb through the northern ridge. Reaching the Kedarkantha summit from the Kedarkantha Base Camp will take approximately 2 hours. At the summit, you will feast your eyes on the glorious view of Himalayan peaks in every direction. You'll be able to see the Gangotri and Yamunotri ranges, which at an altitude of 12795 feet, are comparable to several peaks in the French Alps. You'll return to the base camp for the night. Overnight in tents. You wil trek for about 2 hours from Kedarkantha Base Camp to reach the Hargaon Campsite. You will come across a couple of frozen streams on the way in the winter. From the Hargaon Campsite you will descend further to Sankri Village where you will camp for the night in tents. You will eat a hearty breakfast in the morning. The trek ends here, leaving you free to proceed to Dehradun. Carry a few plastic bags for your clothes in case they get wet. Carry mixed dried fruits as snacks during the trek. • Please carry specific personal or prescribed medication as well as a personal first-aid kit for this trip. Overnight stay in a campsite in Sankri. You will arrive in Sankri today and check in to your campsite. If you need to pick up any last minute essentials for your Kedarkantha trek, today is a good day to buy them in Sankri. You'll eat dinner at camp, and then will retire to alpine tents on double/triple sharing basis. Each tent has sleeping bags, and there is a kitchen tent and toilet tent (1 per 8 pax) for your stay. Overnight stay in tents at the Kedarkantha Base Camp. You will enjoy a hearty breakfast and piping hot tea in the morning, and begin the Kedarkantha trek after that. You will have a guide, a cook, helpers. and mules to assist you during the entire trek. Lunch will be provided en route. Tea and snacks will be provided in the evening. You will camp in alpine tents at the Kedarkantha Base Camp for the night. The morning will begin with tea and breakfast. The helpers provided by the operator will help to pack up the campsite equipment. 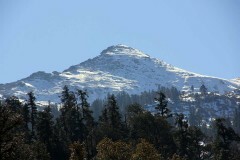 After that you will begin the trek from the Kedarkantha Base Camp to the summit. You will eat a packed lunch and snacks with tea will warm you up in the evening. You will return from the summit to the Kedarkantha Base Camp. After a hot dinner, you'll retire to your tents. After a delicious breakfast and tea you will pack up again to begin the descent from the Base Camp back to Sankri. A packed lunch will be provided in the afternoon, as well as snacks and tea in the evening. After dinner, you will camp overnight in Sankri in alpine tents with sleeping bags. You will eat a wholesome breakfast at the Sankri campsite and wind up your Kedarkantha trek with a hot cup of tea. Your trip will end here. You can reach Sankri by bus/car/taxi from Dehradun. The bus starts at 05:30 hrs, and will take about 4 hours to cover the 200 kms distance.